A little out the way for young children to walk to places, ie the beach. But great for anyone else. Good service, food and rooms were clean. Probably a bit to close to the nightlife for me. Breakfast was average. Room was good but the bed was terrible. Great getaway for all,close to everything,fantastic rooms,very clean, great menu,fantastic staff,great pool area,only negative thing is that. breakfast needs more selections. Great location to get around in Kuta. Dewri Sri is off a small lane way near the memorial, great location to get around in Kuta, very close to the night clubs. The first night we were in the main building and requested to be changed into a villa which had full block out curtains and close access to the pool area and further away from the night club noise. An additional cost of $120 for the week, was well worth it and ask to see your room on arrival. 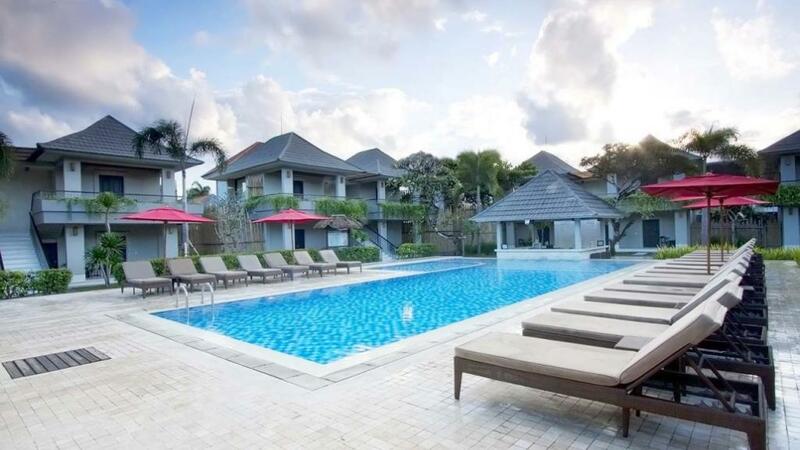 The airconditioner drowned out the night club noise and we were very happy with the location to get around Kuta for our first week holiday in Bali. The staff were excellent the room was comfortable the linen was very tired and requires to be updated but for the price I thought it was well worth it. They have body treatments, hair braiding etc on sight which is excellent value. I have stayed here many times and everyone I have recommended this hotel to and has stayed like me always uses this hotel whenever returning to Bali. Such a great value under rated hotel. Very clean and staff are awesome. Massages, drinks and food are as cheap as out on the street. great place to stay, people are nice and pleasant and well mannered. The service is next to none, wouldn't stay anywhere else. Fabulous stay for our second time. Had a wonderful stay in Dewi Sri... Great location; although very close to clubs and bars the hotel is not noisy at all. Staff are really nice and friendly. recommend to everyone !! Our original room was in a noisy location and they staff gladly moved us without any hesitation. It would be an idea for them to put a shade sail up for the toddlers pool as the whole pool is in full sun most of the day. I would gladly stay here again and also recommend this hotel for other travellers. This was our 2nd stay at the Dewi Sri & we have booked again for December. I looked around while I was in Bali at different options for our next trip but the Dewi Sri still came out on top. Superior rooms are great & all close to the pool. They have recently renovated the family rooms which are great value. Standard rooms are yet to be renovated so best to pay a bit extra for superior rooms. The grounds are open & beautifullly kept. Plenty of shade areas. Everything is at your doorstep! Staff are fantastic! The hotel is managed by an Australian women who is lovely & has lived in Bali for approx 16 years. A taxi from the airport to this hotel in the bustling Kuta district costs approx $6aud. Standard & Family rooms are 1 to 4 stories high. Superior rooms are only ground & first floor. You won't be disappointed with the location of any of the superior rooms all being close to the pool & restaurant. The hotel is not absolutely huge like some of the other hotels where you end up having to take a hike to get to the pool or end up on the 8th floor! Can't speak more highly of this hotel! breaky could have more choice , like a nice big big fruit plate and move the toaster to make the breakfast flow easy, great staff, great spot . nice place to stay for what its worth..Night time you can hear the music but its not to bad. Superior rooms are the way to go!!! sort of like a mini villa look to it. Love the Dewi Sri close to shops and night clubs but you dont hear the music from them. Breakfast is lovely. We had an amazing time in Bali staying at the dewi Sri hotel. The rooms were great, grounds were beautiful, staff were unreal and the price of everything from food and drink to massages were really good. I have stayed in many hotel in Bali all of which were much more expensive and higher star ratings but never again. This place was far better than the rest! I went to this hotel no expecting much, I just wanted a cheap holiday. It has a 2 star rating, which is crazy because it is so nice, but I was told they work it out very differently to what we do here in Australia. **So don't let the star rating of hotels in Bali affect where you plan to stay! The room I stayed in was renovated and really nice. I would happliy go back to Dewi Sri, it's cheap but it is not nasty! Thanks again to my consultant at TravelOnline!